Can you smell it? The aroma of beer foam, hot wings and sweaty American pride? Yes, football season is back, and what better way to bring in the season then with my take on one of the best football stories ever told. Not only because it shows the bonding power of sports, but because it’s true…. all of it. Most people are probably familiar with the NBC/101Network drama series Friday Night Lights. It’s the show that made stars out of Connie Britton, Kyle Chandler, and Taylor “Want-To-Lose-70-Million-Dollars?” Kitsch. It was an important show about coming of age in a small town where football for some is life and death. 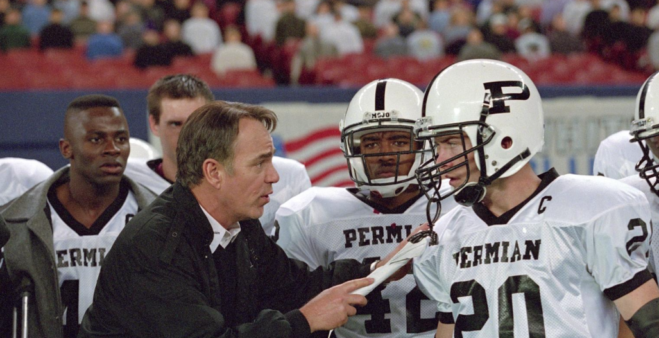 It was also based on the real 1988 season of the Odessa, Texas Permian High School Panthers. Chronicled in H.G. Bissinger’s 1990 book, Friday Night Lights: A Town, a Team, and a Dream, this story was first captured note for note by Peter Berg in 2004. The character types are familiar, then again these are real people. 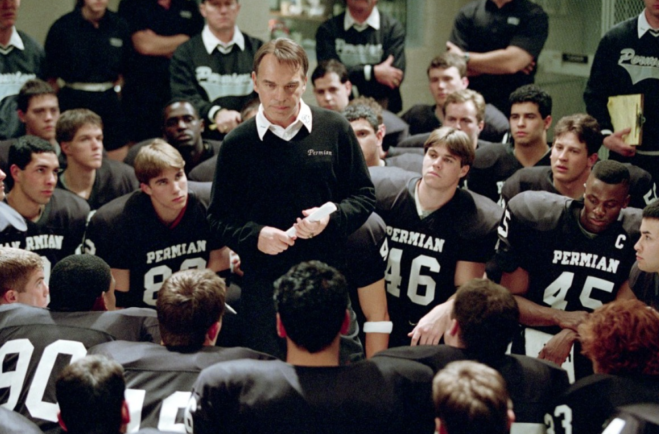 Billy Bob Thornton takes on the role of head coach Gary Gaines. Though he’s not as captivating or intimidating as Kyle Chandler, Billy Bob brings a southern authenticity and handles the smaller scenes well. Lucas Black aka “The World’s Oldest Twenty-Year-Old” from Fast and Furious: Tokyo Drift plays Mike Winchell, a quarterback who plays to make a better life for himself and his poor mother. 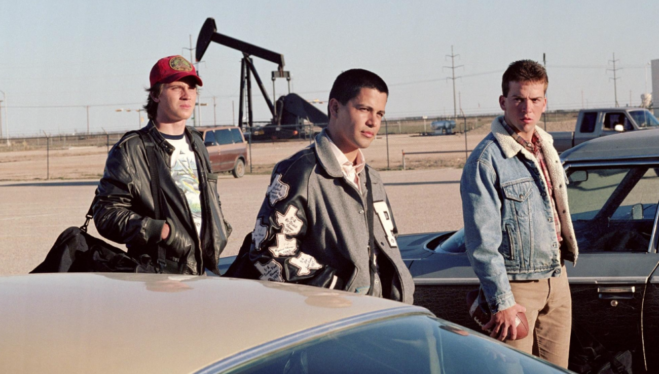 Derek Luke plays Boobie Miles, the team’s flashy running back who’s life is essentially ruined by a preseason injury and Garrett Hedlund plays halfback Don Billingsley, a rebellious teen with an even more rebellious father (played by a surprisingly good Tim McGraw). I almost forgot that Connie Britton plays the coach’s wife in this version as well. Her screen time is greatly reduced to make room for her big hair, but she’s as good as ever. The film is shot in a pseudo-documentary style or “Camera Verite” if you will with constant handheld zoom-ins and zoom-outs. It’s a style we see frequently these days, though you have to remember this was 2004. I don’t think the trend really picked up until shows like the U.S. version of The Office showed how successful a personal approach can be. I’d be lying if I said it always worked. It’s a little odd when Mike is having a tender moment with his mother only to have the camera crash zoom to his left nostril. The constant zooming is effective in the football sequences, though. Something I didn’t realize before going in was the film’s trajectory. Much of the film has that feeling of “Oh, they’ll bring it all together in the final game. They’re gonna win it big!” Not being familiar with the original story that’s what I expected, the film felt like it was going to end that way. Nope, they lose. They lose one yard away from a touchdown in the championship. It’s a shocker but then again it makes the story that much more poignant. Football was all these high school seniors had, now what? if that’s not coming-of-age in its purest form I don’t know what is. It’s relatable, sad and inspiring all at the same time. Particularly, in the case of Boobie Miles. Football was all he knew what will he do? It really makes us question ourselves and the decisions we make. Of course, none of this would be as emotional if not for the film’s sweeping score. Explosions in the Sky handle the film’s alternative rock backing and provide some very high highs in the film’s most inspiring and tense moments. I’m glad that this style of music was carried over into the show by West Wing composer W.G. Snuffy Walden (the greatest name for a person in history). Stylistically, the movie does a good job of taking you into those moments, in the locker room, on the field. It’s a personal experience. But is this better than the show? In the show, we had so much time to grow with the characters and the narrative and there are so many characters I miss in the movie. The All-American-Quarterback (Jason Street) and struggling yokel second stringer (Matt Saracen) are essentially merged together in the movie to make Mike Winchell, but he’s already accepted as a great quarterback. I prefer the uphill battle of Matt Saracen. The film doesn’t have the show’s lovable lackey character in Landry Clarke either, which is a downer. Boobie Miles and Don Billingsley are the same as their counterparts Tim Riggins and Smash Williams. I’m not a hundred percent convinced that Garrett Hedlund and Taylor Kitsch are even different people. The show’s female characters are definitely lacking in the film. There is no Lyla Garrity character, a teenage Julie Taylor, and more disappointing is the incredibly reduced equivalent to Tim Riggin’s girlfriend Tyra Collette (Adrianne Palicki). There’s one scene in the film where Don Billingsley is making out with a girl played by Amber Heard. I guess that’s supposed to be her? She doesn’t do anything though. Even Connie Britton doesn’t have much to do. This is a very dude-centric movie. I know it’s about football but man, so many dudes. One thing that struck me about the film is its ending text. Naturally, we get the “Here’s what this guy did and this guy, blah, blah.” But then we are informed that the team (minus the main senior characters) went undefeated the next season and won the championship. “Why didn’t we get a film about that story?” Some might ask. Aside from the fact it wasn’t the season H.G. Bissinger chronicled, I think a story about growing and learning from a loss is far more powerful. This is a film about how we learn to pick ourselves up and make the most of it. Winning doesn’t have to be everything, there are other ways to be happy and live a meaningful life. Which can be easy to forget every year, week-in-week-out, especially on Fridays.